Pablo Picasso was a Spanish painter who got famous for his many line drawings that have earned him clamor from different quarters. He wasn't only a painter, but a sculptor, ceramicist, and was also involved in a host of other artistic disciplines. Picasso has been able to use line art to create images of different animals, things, people, and related activities. Picasso line paintings look quite simple, but clearly depict things in an indubitable scale. An image like "Don Quixote" is one of his many artworks that show his artistic prowess. 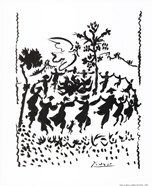 Since Picasso line art captures different things and activities, it's quite simple selecting his artworks for wall decoration. At the same time, his art pieces are available in different colors and sizes. You can therefore take advantage of these prints to make your interior design speak to you and other room occupants. Ensure that you get the right inspirations and strengthen your preferred theme accordingly. To achieve that, you need to select Picasso line drawings already aware of the exact space where they'll be mounted. It's equally important to know the kind of decor items used in the room. Having such information at your fingertips makes it effortless to identify the right artworks for your room.